This morning, just in time to save my bacon, a new picture arrived from Babs. She writes, My Columbus friends will know this is not Michigan, so for my Michigan and other friends, this the Wexner Center for the Arts at The Ohio State University. There was an excellent exhibit of the the work of Annie Leibovitz, a beautiful blue sky and wonderful architecture, which said I had to photograph it. Naturally I wandered around on the Wexner Center website, where I learned that Annie Leibovitz is—in addition to being Annie Leibovitz, which is a good and sufficient reason to show her work—the latest recipient of the Wexner Prize. The best thing about the prize (in addition to the tidy sum involved) is that it is accompanied by a presentation hammer created by sculptor Jim Dine. He says that hammers, which can be used to build as well as to break apart, symbolize the creative force that drives artists. That strikes me as exactly right. Besides, anyone who uses a computer in the course of creating might find ready uses for a shiny hammer sitting right there on the desk. Yes indeed. I digress. Reading about the Wexner Prize reminded me of ArtPrize in Grand Rapids, and that reminded me of a note from Linda, a/k/a shoreacres, who writes The Task at Hand. Linda is a reliable curator of the internet, so when she suggested a visit to Start Garden off I went. Like ArtPrize, Start Garden is a project by the endlessly inventive Rick DeVos, this time for inventors and entrepreneurs. I spent way too much time prowling around over there, and now my head is full of interesting notions. And you thought this post was going to be about road repair. I did think it was going to about road repair. I am very disappointed. I can see that I must whip up a recipe for asphalt before my next post. Road repair did not enter my mind. I’ve missed you, though. Aw, shucks. Thank you P.J. Why thank you. I suppose I must return to the world and put up some posts. I thought it would be about asphalt too! And was intrigued…how would you spin pavement into an interesting story? But this was much more fun. Some weeknight I will go check out those links myself. I’ve missed you too. Now I have an assignment. In fact I think I know exactly how to spin pavement–or a road in any case–into an interesting story. As a banker, I believe you would be well advised to seek out information about Start Garden on your bank’s time. It is pretty interesting. Oh, my! Glad you found Start Garden of interest. And I’m especially glad to see you back. Asphalt never crossed my mind. Persephone, maybe – although it’s the wrong season. No matter. 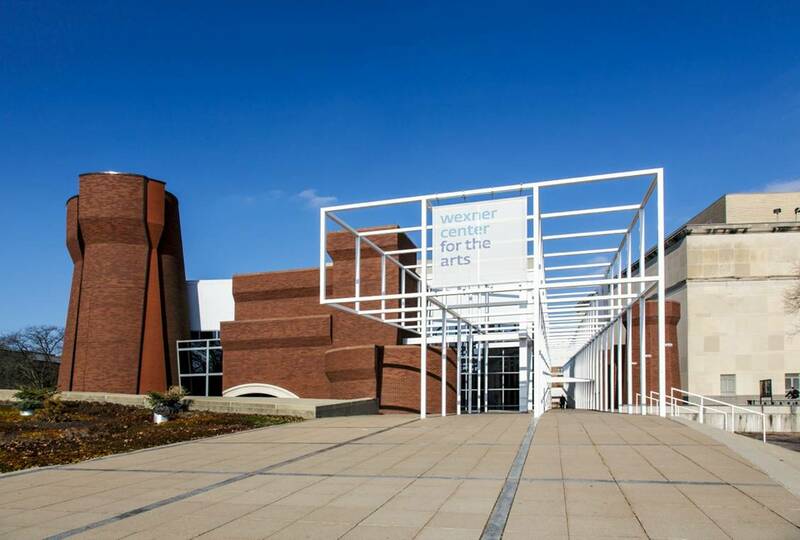 The Wexner Center’s quite a deal, although that thingie on the left reminds me of a cooling tower at a nuclear plant. Perhaps that’s what it’s meant to evoke. More exploration may be called for. I thought, too, that the architecture referenced heavy industry – I can see the cooling tower, but what came to my mind was Sloss Furnaces in Birmingham Alabama (the park/museum made from an abandoned steel mill). I often wonder how these impressions emerge – whether the architect, artist, or writer deliberately evoked a particular image, arrived at it by accident but recognized it, or perhaps never thought of any such thing and it’s all a product of my own overheated imagination . . . Anyway, as you say, more exploration may be called for! The towers are references to a building that was once on that site. It was an old armory built in the 1800’s. Here is photo reference to that building. Now that is what I call a creative nod to the past. (Really – follow the link and run your cursor over the old image to see exactly how well they relate.) Thank you, Babs. It is amazing what will spark the notion to photograph “something”. Sometimes planned, sometimes not, the creative part of the human spirit is wonderful to see and be. I am always taken aback when someone says “But where do you get your ideas?” Ideas are never the problem, are they – the sparks are out there everywhere. Making them burst into flame, now, that’s a challenge. I am happy you are resurfacing Gerry, very happy too that you had a nice long rest. Those are needed at times. Isn’t this sculpture of hammer by Jim Dine very special and beautiful? With many good wishes for a Happy Holiday Season to the three of you.